Click on the Apple in the top left of your screen and select "System Preferences" or click on "System Preferences" on the task bar. Then in the "Internet & Wireless" section click "Network"
Below the left hand column where your connections are listed, there is a small plus sign. Click on it. For the VPN Type select "PPTP". For the Service Name choose a name like "Usaip" and click Create. Please note that the Interface and VPN type cannot be adjusted later, so if you make a mistake, you will have to delete the connection and start over. Now on the left hand side, you have a new connection with the name that you just chose. Select it to configure. Enter one of the server names you received in the welcome email from us (for example: vpn1.usaip.eu) into the "Server Address" field. For the account name use your USAIP.EU username. 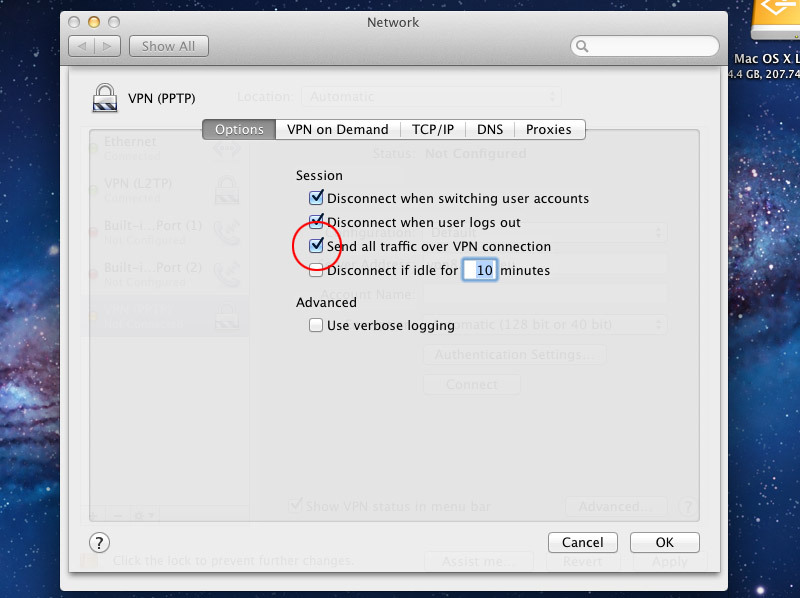 Check the box to "Show VPN status in menu bar" for easy access later. Now click on "Authentication Settings...". In the list that appears select Password. 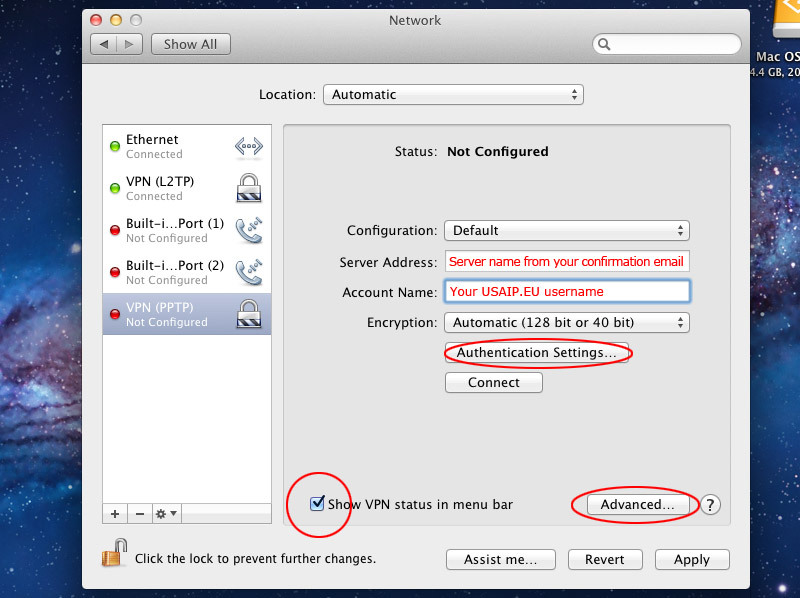 Type in your USAIP.EU password and click OK.
Click on "Advanced" and check "Send all traffic over VPN connection" . Then click "OK" and "Apply"
You are now all set! 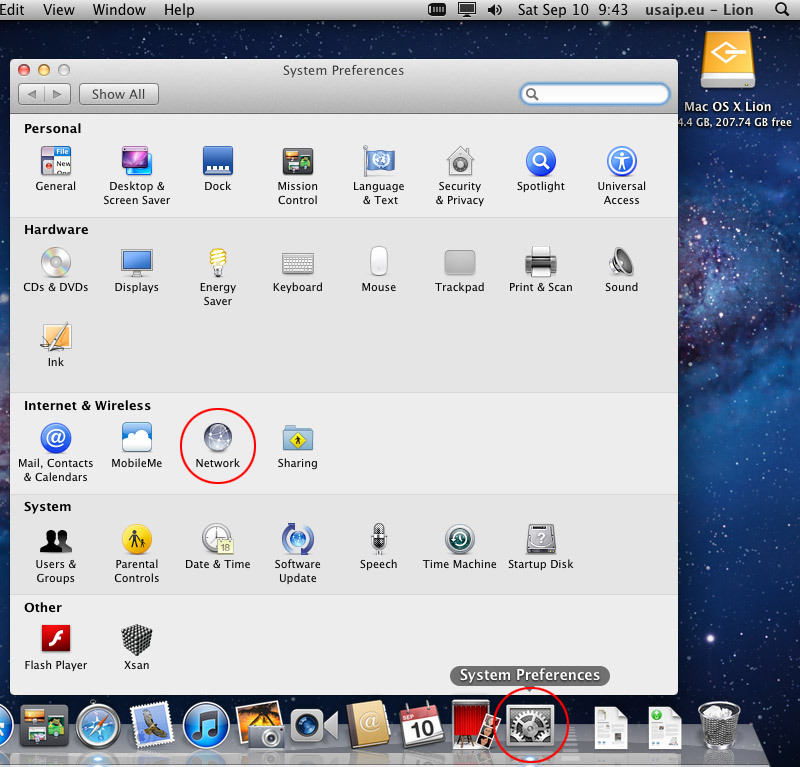 Look up to the top right in your menu bar and you should see the network menubar item. Click on it and then click "Connect"
Disconnect by selecting the network menubar and clicking on "Disconnect"